Slash: Could a reworking of My Humps be in the offing? We already knew that Slash was working on a solo album - now it transpires that he's lined up a few special guests to appear on it. Speaking to Rockerrazzi.com, the former Guns N' Roses guitarist's wife Perla Hudson said: "It's going to be Slash and friends, with everyone from Ozzy [Osbourne] to Fergie." 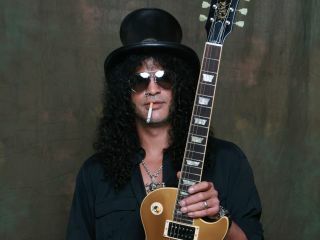 Slash performed a live version of The Beatles' In My Life with Osbourne at the 2005 Royal Variety Performance, and took to the stage with Fergie earlier this year. However, this will be the first time he has recorded with either artist. Hudson also revealed that Slash "feels great" about the release of Chinese Democracy, adding that "Our kids like it but they also like Elmo, so that goes without saying." Surely she's not comparing Axl Rose to a muppet? Mrs Slash may be enjoying the new Guns N' Roses' new record, but she doesn't seem to be the world's biggest Velvet Revolver fan. When asked what she thought of the band, she replied that it was "not my husband's best work".